Even if you’re a Red Sox fan, you have to admit that Alex Rodriguez is an extraordinary baseball player. Unless he’s caught, say, wagering on Reds games, he’s a lock for the Hall of Fame- and almost certainly first-ballot. He plays high-profile ball on a high-profile ballclub, and even most casual fans know of his accomplishments. However, it’s probably also fair to say that a decade after he retires, he’ll be one amongst many, and his name will fail to carry the same gravitas that the utterance of names such as Ty Cobb and Honus Wagner carries. It would not surprise many to learn that if we were to compare Cobb and Rodriguez in some sort of Deadliest Warrior baseball variant, Rodriguez would emerge the victor. Why, then, the disparity in reputation? Certainly, one must conclude, there is a value to be placed in getting your accomplishments in early in the development cycle for the game you’re participating in. We love our legends, and while latter-day legends do happen (see: Wayne Gretzky, Michael Jordan), there’s certainly a steeper hill to climb to obtain that status. To earn it, you must stand head-and-shoulders above your contemporaries, a feat more easily done in the infancy of your undertaking. The more heads and shoulders there are, naturally, the taller you must be to be so enshrined. And so it is that in a game filled with Patrick Chapins, Brad Nelsons, and Luis Scott-Vargases, players so well-established that they are known not only by their accomplishments but by their personalities, that a name like Jon Finkel still resonates. The Pro Tour made its debut in 1996 in New York, and a young Jon Finkel made it into the Top 8, putting himself on the map and beginning a journey that would see him become one of the brightest stars in Magic’s sky. By the turn of the milennium, Finkel had racked up no less than eight first-place finishes: three Grand Prix, three Worlds, a Nationals and a Pro Tour. Such was Finkel’s stature (“the most illustrious Magic player in the world,” according to Wizards of the Coast) that Wizards extended him a unique invitation: take on Magic creator Richard Garfield in a battle of wits and skill, with a corresponding preconstructed product release. Thus was Deckmasters: Garfield vs Finkel born. And with those restrictions firmly in place, “Johnny Magic” rolled up his sleeves and got to work. The result? A 62-card Red/Black burn-n-beats deck driven by a Necropotence engine. We’ll start our analysis with the beats. Though these selections do surrender the early field, the deck does have some explosive potential with a pair of Dark Rituals included. One additional factor bears explicit mention before we deconstruct the deck- Finkel’s metagame was one person: Richard Garfield. Finkel’s selections offer a perfect example of the need to minimise variance. Given the restiction of only two copies of any one card, he selected his ten three-drops by finding the best cards available in that slot and throwing in two copies of each. Foul Familiar: A Black version of a Blinking Spirit, the “can’t block” provision was likely added to prevent the Familiar from becoming a very persistent defensive creature. Later, the few cards with a comparable ability (1997’s Selenia, Dark Angel; 1998’s Hibernation Sliver; 2001’s Cavern Harpy; 2007’s Crovax, Ascendant Hero; and 2007’s Wydwen, the Biting Gale) had no such restriction in place. 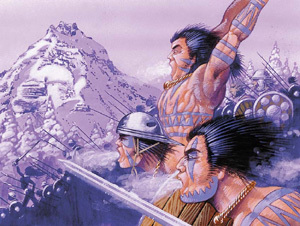 Orcish Cannoneers: Back before the Goblins emerged as the weenie tribe for Red, Orcs were competing with them for cards. Ironclaw Orcs were in Alpha, as were the Orcish Artillery (the card upon which the Cannoneers are based). Although Fallen Empires gaves the Orcs much-needed love, survival of the fittest winnowed them out to virtual extinction (the last original Orc was printed in Time Spiral, which tells you something right there). Even the mighty Cannoneers were eventually “converted at swordpoint,” turning into Magic 2010’s Goblin Artillery. Regardless of tribe, the card has some value in an aggressively-minded approach, illustrating the Black/Red “anything to win” approach. Phyrexian War Beast: The most efficient beater in the deck, but also one with a potentially dangerous downside (not surprisingly given the word “Phyrexian” in its name)- the Beast pinged you and took a land with it on the way out. Still, a 3/4 for only three colourless mana was too good to pass up. From there we see the four different cards that comprise the deck’s four-drops. Again, two of each card except for one of the deck’s Rares. Abyssal Specter: A direct, “fixed” descendant of the original Hypnotic Specter, the Ice Age version came with an extra point of toughness, but cost one mana more and forced only selected discard, as opposed to the far superior random discard of the original. Random discard was soon to have its glory restored as Fallen Empires contained one of the best discard spells of all time: Hymn to Tourach. Balduvian Horde: Players with long memories will immediately remember the Horde, as it was the “chase rare” of Alliances back in its day. A 5/5 for four mana- yes please! Over time as the concept of card advantage gained wider currency, the glory of this card faded, but it’s a great inclusion here if for no reason other than nostalgia for its pilot. Goblin Mutant: Continuing the proud Goblin tradition of powerful members of the tribe having troubling drawbacks (see: Mogg Flunkies for a later example), analysis showed that the benefit of this card was probably outweighed by its handicap. Soon after, Fallen Empires would offer the archetype a new lease on life with the Orgg, which for one mana more was a 6/6 instead of a 5/3. Phantasmal Fiend: The atypical lack of Blue in the deck didn’t stop Finkel from knowing a good card when he saw it, for it’s “nearly unkillable” 5 toughness would be hard to deal with in the format. 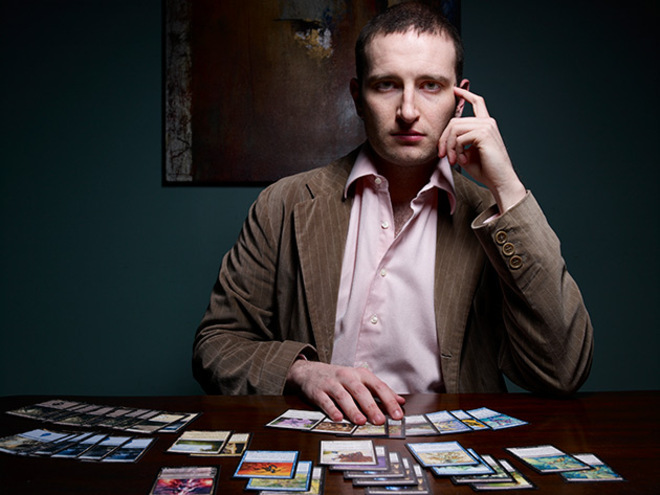 Finkel applied a single-minded focus to his noncreature support as he did to his creatures: identify the good ones, then add two copies of each. With rare exception, these supporting cards are burn/direct damage, and removal. There are no shortage of ways to finish off a wounded enemy here. Two Incinerates are the gold standard in a Lightning Bolt-free environment. Guerrilla Tactics shave a point of damage off for the same mana, but have an unusual if-discarded clause (though likely Finkel was just looking for workable burn). Lava Burst was the set’s straightforward red-X spell, following in the tradition of the common Fireball and Disintegrate (which faded to longstanding obscurity but is returning as Red Sun’s Zenith in Mirrodin Beseiged). Finally, Soul Burn is the kind of convoluted card you’re unlikely to see printed in today’s environment. Flavour-rich but mechanically clunky, it attempts to simulate the draining of a creature’s soul. Next there’s the abundant creature-kill, which while lacking the reach of the previous cards still have a vital role here. We have a pair of the proto-Doom Blade card Dark Banishing, which for one more mana adds a non-regenerative clause. Contagion was Black’s contribution to a very famous cycle of cards that allow you to play it without mana if you exile a card from your hand. While all but one of the rest of the cycle has been more or less lost to time (Scars of the Veteran, Bounty of the Hunt, Pyrokinesis), most players are quite familiar with its success story, Force of Will. Finally, the two Pyroclasms will be quite familiar to the modern player of the game, filling the same role then as it does now- an anti-weenie board-sweeper. While the pair of Dark Rituals has already been mentioned above, the final three cards are some of the most powerful in the game in their age. Two copies of the infamous Icy Manipulator (one premium black-border foil, one deck-standard white-border) were added in for disruption, and the marquee card of the “Black Summer” itself, Necropotence. Then as now, trading life for cards is frequently a good deal, as we see from cards ranging from Phyrexian Arena to Sign in Blood. In the next column, we’ll turn our attention to Richard Garfield, Magic’s creator and Jon’s competitor in the Deckmasters challenge, and see what his incredibly creative mind has cooked up. From there we’ll be pitting the decks against one another, and recording our results. See you in two days’ time! Want to share this article? I was curious about these two decks knowing they were going to be analyzed soon. I did some research on the Wizards site and found a small article that gives insight into what Garfield and Finkel were thinking when they made their decks. I may not know who the top players are these days, but I knew those two. I love these two decks because they showcase two expansions that I played with A LOT and that were truly expansions. They had an inkling of a storyline, some cohesiveness, and had so many fun cards to play with although the game was much different then. 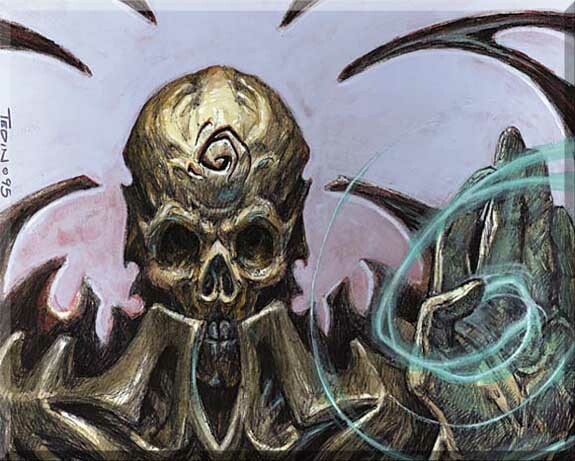 If you’re interested, here’s the link: http://www.wizards.com/magic/tcg/productarticle.aspx?x=mtg_tcg_deckmasters2001_themedeck#deck1. I’ve actually wanted to get a hold on this set for awhile, so these reviews are very much appreciated from a “is it worth it” standpoint. It wasn’t long after this set came out that I first caught a glimpse of Magic. Cards looked funny to me compared to what I was used to in Duel Monsters (what most people call Yu-gi-oh.). This set of reviews is a nice glimpse into the past. The irony being, of course, that Magic was first and Konami actually has to pay Wizards to use their patent on “collectible card game elements”. Indeed. The whole magic cards vs spell cards thing was amusing. I kind of miss the Deckmasters and World Champion deck series. Sure we can look up the play coverage on Wizards or YouTube these days, but actually playing those decks gives you an insight into both the player and deck designer. It seems so simplistic since it’s a quick way to put serious tournament power into your hands, but I think it’s no different than chess players who set up historic board matches so they can think their way through the situation. If they ever do go back to that format, I’d like to see Turbo-Stasis vs. Necropotence. It’s probably a profitability thing. I know Pokemon still prints 4 decks each year that placed at Worlds, and they’re different-backed and silver-bordered, so obviously not tournament legal, but…I dunno how it looks on paper for Wizards. Just curious about the exploded deck in front of Finkel in the picture. Is it the winner deck from some limited tournament or what? 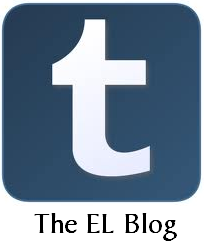 Enter your email address to subscribe to Ertai's Lament and receive notifications of new posts by email.